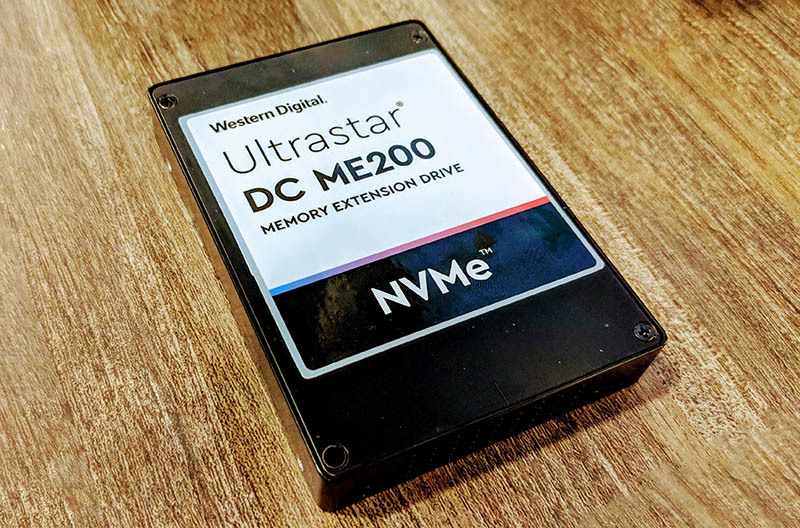 The Western Digital Ultrastar DC ME200 utilizes software from ScaleMP to achieve a simple task: allow a system to run larger in-memory datasets. 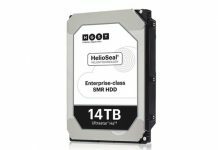 Western Digital and ScaleMP have been working on this type of solution for a while, but this is the first formal announcement we have seen for installations as small as two drives. Here is the basic premise diagram. One can use Western Digital Ultrastar DC ME200 NVMe SSDs along with ScaleMP software and essentially add NVMe SSDs to your main memory pool. Although the NVMe drives are slower, the large DRAM caches in the NVMe SSDs help performance. Losing some performance for being able to work with larger in-memory data sets is an enormous advantage for some teams. For form factors, the Western Digital Ultrastar DC ME200 comes in U.2 or PCIe AIC form factors and 1TB, 2TB, and 4TB capacities. Drives come with 3-year warranties which is important since they are going to be in a potentially write-heavy workload as a substitute for DRAM. 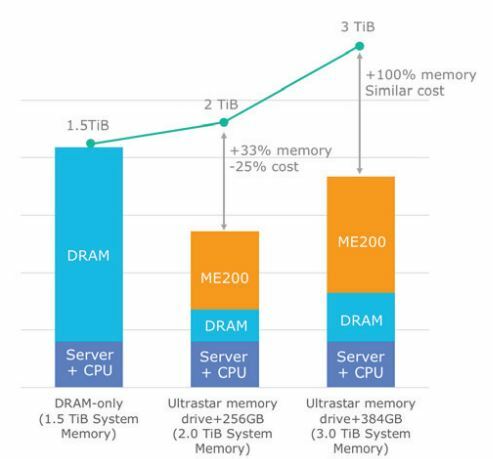 Western Digital and ScaleMP normally claim well upwards of 85% of the performance is retained using NVMe as main memory for applications like Redis. One does not need to purchase “M” series Intel Xeon Scalable CPUs and does not need to spend an enormous amount on large DRAM modules. There is a catch. Even though NAND-based NVMe storage is persistent, this solution is not. If one looks forward a few months to Intel Optane DC Persistent Memory, there will be a significantly higher performing, and persistent offering in the marketplace at around 4x the cost. 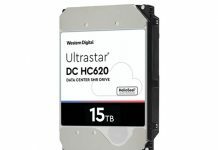 We were told there is a “special” bundle using two Western Digital DC ME200 drives (one source said 1TB and one said 2TB) for $4999. The software component is getting heavily weighted in the cost. If this sounds familiar to STH readers, there is a reason for that. 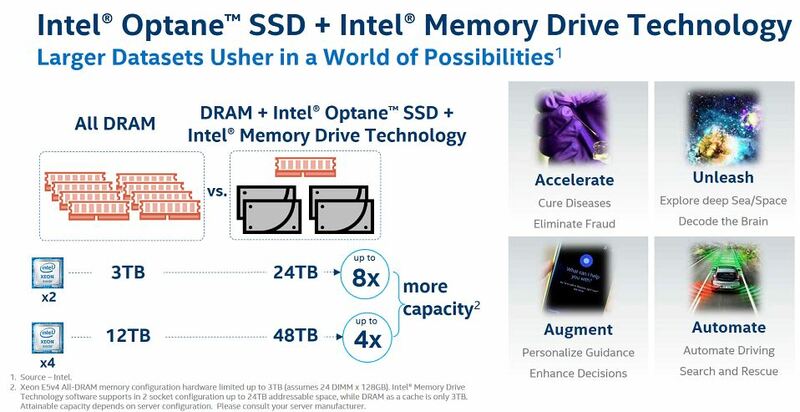 Intel also launched the Intel DC P4800X Optane-based NVMe SSD with a similar memory expansion capability. This is called Intel Memory Drive Technology and is also powered by ScaleMP’s software. Western Digital was cautious not to mention its performance relative to that competitive solution. On the other hand, the company is shipping the 4TB Western Digital Ultrastar DC ME200 so it can out scale the current Optane NVMe SSDs. I would say that this reminds me of SanDisk’s ULLtraDIMM (https://en.wikipedia.org/wiki/ULLtraDIMM) but SanDisk was bought by Western Digital, and the product subsequently blocked from entering the US due to an IP dispute: https://www.extremetech.com/computing/197546-sandisks-ulltra-dimm-derailed-company-banned-from-shipping-hardware-to-us with NetList. Meanwhile there is HybriDIMM from NetList: http://www.netlist.com/products/Storage-Class-Memory/HybriDIMM/default.aspx which offers fast SSD storage for DIMM slots. SSD with a DRAM cache in a DIMM slot looks like a good way to fill those empty slots and gain cheaper (but slower) memory capacity. Too bad the squabbling and IP theft is slowing this coming to market.